Substance abuse can simply be defined as a pattern of harmful use of any substance for mood-altering purposes. "Substances" can include alcohol and other drugs (illegal or not) as well as some substances that are not drugs at all. "Abuse" can result because you are using a substance in a way that is not intended or recommended, or because you are using more than prescribed. To be clear, someone can use substances and not be addicted or even have a substance use disorder, as defined in the Diagnostic and Statistical Manual 5 (DSM 5). In other words, if you drink enough to get hangovers; use enough drugs that you miss work or school; smoke enough marijuana that you have lost friends; or drink or use more than you intended to use, your substance use is probably at the abuse level. However, the broad range of substance abuse in today's society is not that simple. Generally, when most people talk about substance abuse, they are referring to the use of illegal drugs. Most professionals in the field of drug abuse prevention argue that any use of illegal drugs is by definition abuse. Illegal drugs do more than alter your mood. They can cloud your judgment, distort your perceptions, and alter your reaction times, all of which can put you in danger of accident and injury. These drugs got to be illegal in the first place because they are potentially addictive or can cause severe negative health effects. Any use of illegal substances is considered dangerous and, therefore, abusive. Others argue that casual, recreational use of some drugs is not harmful and is merely use, not abuse. The most vocal of the proponents of recreational drug use are those who smoke marijuana. They argue that marijuana is not addictive and has many beneficial qualities, unlike the "harder" drugs. But recent research has shown that even marijuana may have more harmful physical, mental, and psychomotor effects than first believed. Each year, new scientific studies find more ways that long-term marijuana use is harmful to your health. In addition, the National Institute on Drug Abuse (NIDA) reports that marijuana users can become psychologically dependent, and therefore addicted. NIDA estimates that one in every seven users of marijuana becomes dependent. Alcohol, prescription, and over-the-counter medications, inhalants and solvents, and even coffee and cigarettes can all be used to harmful excess. In fact, many children have their first encounter with substance abuse by using inhalants, simply because they are found in many common household products and, therefore, readily available. In today's culture, we now have "designer drugs" and synthetic drugs, such as fake cocaine (bath salts) and synthetic marijuana, which may not yet be illegal, but can certainly be abused and can possibly be more dangerous. There are also substances that can be abused that have no mood-altering or intoxication properties, such as anabolic steroids. The use of anabolic steroids to enhance performance or develop muscles and strength is abusive because of the negative side effects of their use, which can range from merely annoying to life-threatening in some cases. If it can cause you harm, even in the long term, it is substance abuse. Theoretically, almost any substance can be abused. Alcohol is, of course, legal for adults over the age of 21 in the United States, and there is nothing "wrong" with having a couple of drinks with friends or to unwind on occasion. But, it doesn't take much alcohol to reach a harmful level of drinking, and that is when alcohol use can turn into alcohol abuse. Drinking five or more drinks for men (four for women) in any one sitting is considered binge drinking, which can be harmful to your physical and mental health in many different ways. If you even occasionally engage in binge drinking, your alcohol use is by definition alcohol abuse. Nicotine is the single most abused substance in the world. Although smoking has declined in recent years, it is estimated that 40 million Americans are still addicted to nicotine in spite of its well-publicized harmful effects. Again, just because it is legal, doesn't mean it can't be abused. The fact that the negative health effects of nicotine take a long time to manifest probably plays a role in the widespread abuse of tobacco. Whereas nicotine is the most abused drug, caffeine is the most commonly used mood-altering drug in the world. And yes, too much caffeine can be harmful to your health. It has been linked to significantly increased risks of cancer, heart disease, and reproduction abnormalities including delayed conception and lower birth weight. Studies have also found a link between caffeine use and several psychiatric syndromes, including caffeine-induced sleep disorder and caffeine-induced anxiety disorder. Patients diagnosed with generalized anxiety disorder, panic disorder, primary insomnia, and gastroesophageal reflux are usually advised to reduce or eliminate regular caffeine use. Is It Causing You Harm? For many legal substances, the line between use and abuse is not clear. Is having a couple of drinks every day after work to unwind use or abuse? Is drinking two pots of coffee in the morning, to get your day started, use or abuse? Is smoking a pack of cigarettes a day substance abuse? Generally, in these situations, only the individual himself can determine where use ends and abuse begins. The question to ask yourself is, "Is this causing me harm?" When it comes to illegal substances, society has determined that their use is harmful and has placed legal prohibitions on their use. This is to both protect individuals' wellbeing and shield society from the costs involved with related healthcare resources, lost productivity, the spread of diseases, crime, and homelessness (although the impact of criminalizing this use has been open to considerable controversy). Has your substance use become harmful? If you think this may be true for you, you are certainly not alone. According to the latest estimates, about 27.1 million Americans—approximately one in every 10 people—are current substance abusers. Are you hesitant to seek help for your substance use? Again, you are not alone. In 2015, an estimated 21.7 million people needed substance use treatment, but only 3 million actually received any treatment. 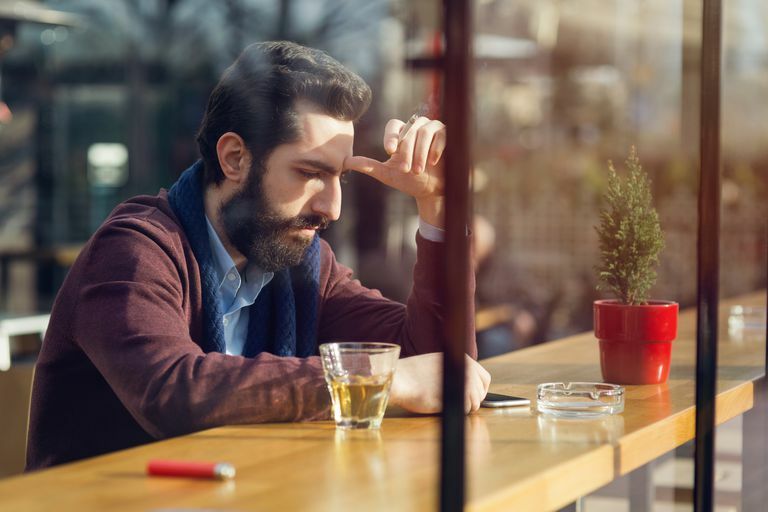 If you have tried to quit or cut back on your own and found you were not able to do so, you may want to try other options and learn more about treatment for substance abuse.